Chase Elliott and Darrell ‘Bubba’ Wallace Jr. Are Also A Part of The Pre-Race Experience. The Pre-Race Experience not only gives fans a chance to sign the start/finish line and watch STP 500 driver introductions from the track, it also give them the opportunity to hear from seven different Monster Energy NASCAR Cup Series drivers in emceed question-and-answer sessions. Trevor Bayne, Matt DiBenedetto, AJ Allmendinger, Chris Buescher and Cole Whitt are the latest to add their names to the list of drivers participating in the $25 experience. Bayne, DiBenedetto, Allmendinger, Buescher and Whitt will join Chase Elliott, the 2016 Sunoco Rookie of the Year and two-time NASCAR Playoff contender, and Darrell ‘Bubba’ Wallace Jr. as a part of the Pre-Race Experience. The Pre-Race Experience gives fans the chance to watch driver introductions from the track, along with a morning full of fun and excitement on the track. In addition to the emceed question-and-answer sessions, the Pre-Race Experience offers fans the opportunity to walk the frontstretch on race morning, sign the start/finish line, have a photo opportunity in mock Victory Lane, and enjoy music, games and prizes. The cost of the Pre-Race Experience is $25 for adults and $15 for youth 17-and-under. The driver question-and-answer sessions, music, games and prizes will be held on the frontstretch beginning at 10:00 a.m. and will remain open until the conclusion of driver introductions. 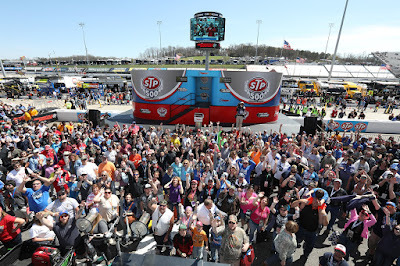 Admission to the Pre-Race Experience does not include a ticket for the STP 500.